Inspired by a desire to research poverty reduction strategies in the developing world, Amanda Judge left her work in the financial industry to study social and economic development in Ecuador. Upon arriving in Ecuador, Amanda quickly realized that the best way for communities to sustainably bring themselves out of poverty was through viable employment opportunities and holistic education programs. Faire Collection was birthed as an answer to the very present need for families who were stuck in a cycle of poverty to have access to profitable markets. For 7 years, Faire Collection has been a transformational force in the Social Enterprise and Fair Trade industries, bringing ethically sourced goods created by artisans to major US retailers such as Anthropologie, Free People and Nordstrom. Families who were once living under the weight of the cycle of poverty in Ecuador and Vietnam, now have the earnings to send their children to school, to invest in healthcare andimprove their quality of life for their families. Faire Collection's design esthetic is deeply influenced by the artisans of Faire Collection and their countries of origin. 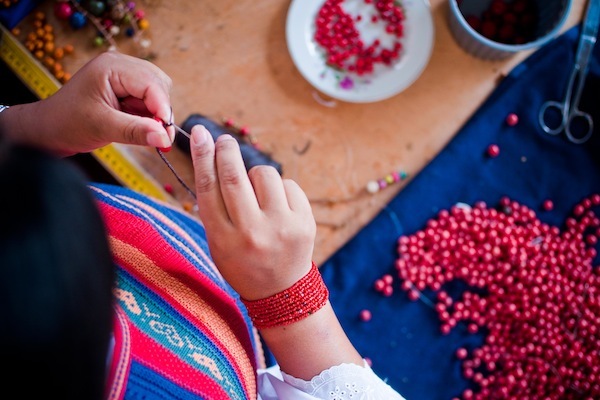 The collections promote the cultural heritage of Ecuador and Vietnam by modernizing ancient techniques to appeal to modern consumers. Faire Collection’s artisans work with natural materials that are sustainably sourced. Through manual, low energy processes, artisans transform these materials into beads, which have sculptural natural irregularities, both in color and form, creating unique and diverse pieces. Faire Collection’s work is vibrant and colorful, representative of the cultural richness of the countries they are created in. Through her work with Faire Collection, Amanda has placed a tremendous emphasis on creating a company of excellence. At the beginning of her work with Faire Collection, over 7 years ago, Amanda had the foresight to know that a social enterprise jewelry line would only succeed if consumers and retailers were confident the in the contemporary design esthetic of her products and quality of her business practices. In both fashion and impact, Faire Collection has changed the landscape of what to expect from fair trade products. Faire Collection founder, Amanda Judge is a frequent contributor to Conscious Magazine on topics like Fair Trade and the Artisan movement.